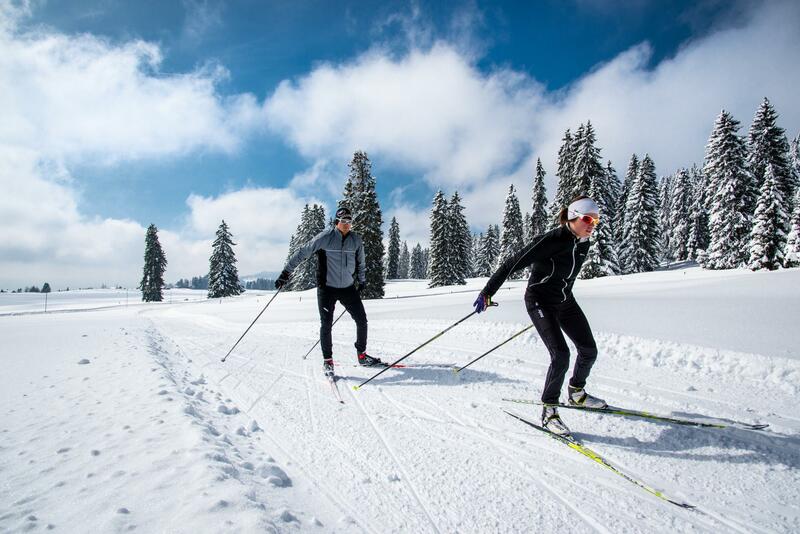 With unique panoramic views of over 250 km of the Alpine chain, the trails of Les Rasses Nordic Ski Area cover 65 km and are suitable for both cross-country skiing techniques. For a unique night skiing experience, the Les-Rasses – Les Cluds circuit is floodlit until 10 p.m. every evening. Every year, the area plays host to “La Mara”, the famous popular international race. The trails of L’Auberson Nordic Ski Area and Mont des Cerfs are known for their spectacular Nordic scenery. With forests, sunny plateaux, pastures and a nature reserve, this unspoilt Nordic area will create unforgettable memories for cross-country skiers. Trails run from L'Auberson to Les Fourgs Nordic Ski Area in neighbouring France and Côte-aux-Fées in the Neuchâtel region and the Mont des Cerfs trail runs from the Col des Etroits (Sainte-Croix) to L'Auberson.